Other parts of Africa have lions and elephants and zebras and gorillas, the kind of wildlife people travel halfway across the world to see. We have Gambian pouched rats. 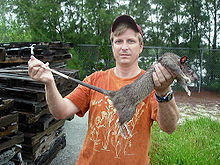 According to Wikipedia, Gambian pouched rats can grow up to three feet in length, only half of which is tail. They have pouches in their cheeks like hamsters (hence the name) to fill with food that they can carry home to their lair. A day or two ago one of them decided to make its lair under the hood of my car, where it got stuck, died a grizzly death, and remained there until the guards pulled it out, reeking, this morning. Joy. It wasn't quite as big as the one in the picture, but close. I had hoped we were rid of these things a few weeks ago once we caught the one who had been living in Seamus's attic and driving him crazy by slowly, slowly, night after night, scratching down through the drywall. Clearly we have a little more pest control to do. On the other hand, Wikipedia also says Gambian pouched rats can be trained to put their excellent sense of smell to work, detecting landmines and tuberculosis. Maybe instead of exterminating ours we should collect them and start an NGO instead. Or maybe not.